When I first started quilting nearly 20 years ago, the method for making half-square triangles was pretty straightforward and limiting. Cut your squares 7/8-inch larger than the finished block, stack them together, sew a 1/4-inch seam on both sides of a center line, cut them apart, and press. You were supposed to have the right sized blocks following these steps. Except I never did. Ever. It was so frustrating. And while a number of novel ways to create half-square triangles have come along and the rulers – oh, the rulers! 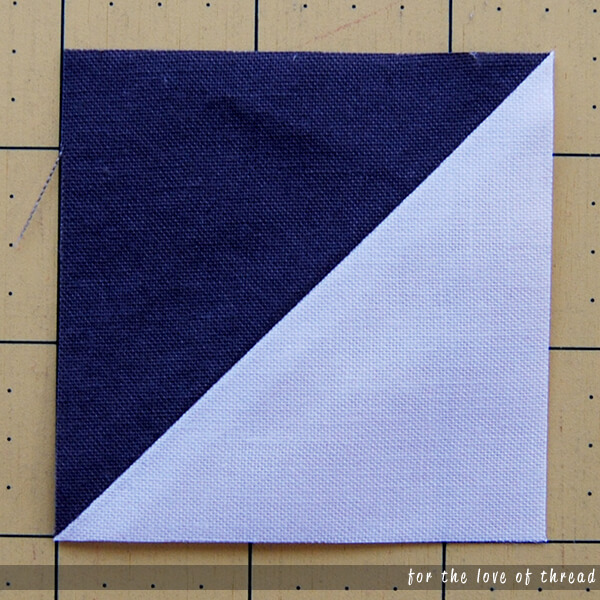 – make creating them clever, my favorite way to make half-square triangles is to make them bigger than I need to and them trim them down after they’re sewn. A perfectly pieced and sized half-square triangle! Copyright 2017-2019. All content and images property of For the Love of Thread unless otherwise indicated. If you like what you see here, sharing is caring. Please use the social sharing buttons throughout the site. If you would like to get permission for any other use of content or images on this site, just send me a message. Here’s where you can read all the legal stuff about how this site generates revenue through relationships with various merchants. Where should I send the news?